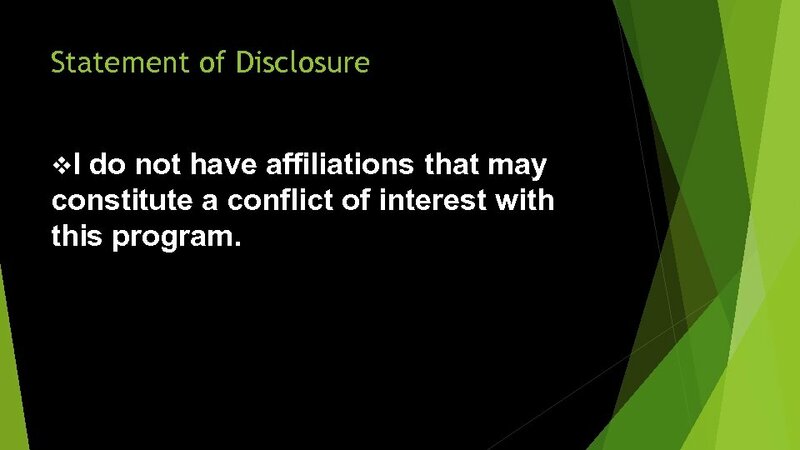 Statement of Disclosure v. I do not have affiliations that may constitute a conflict of interest with this program. 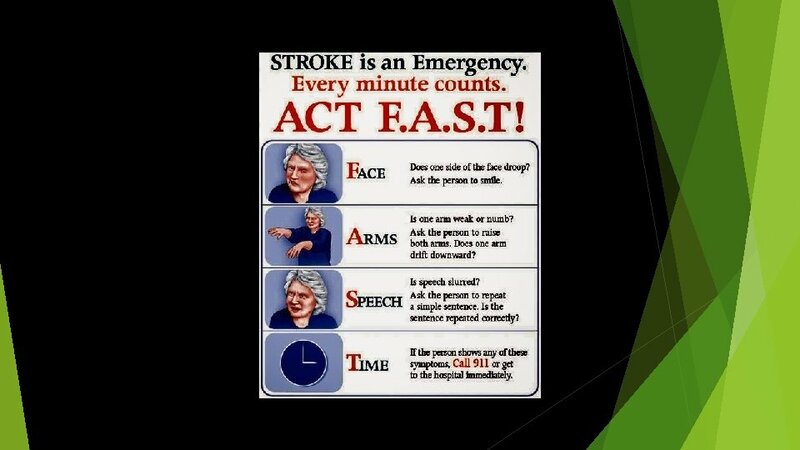 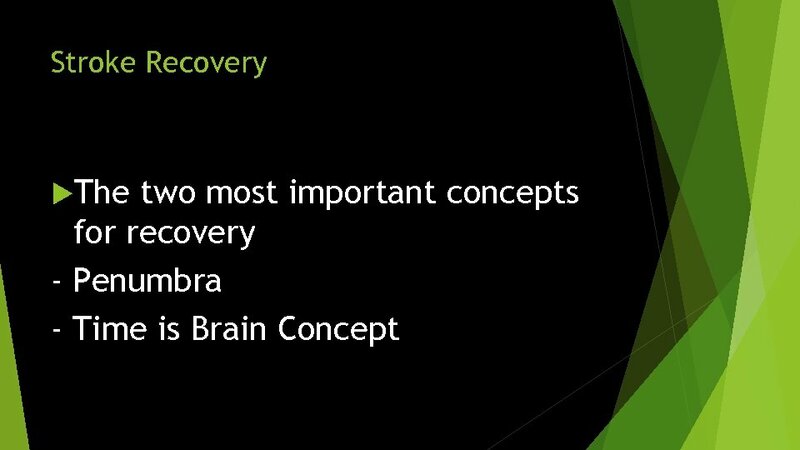 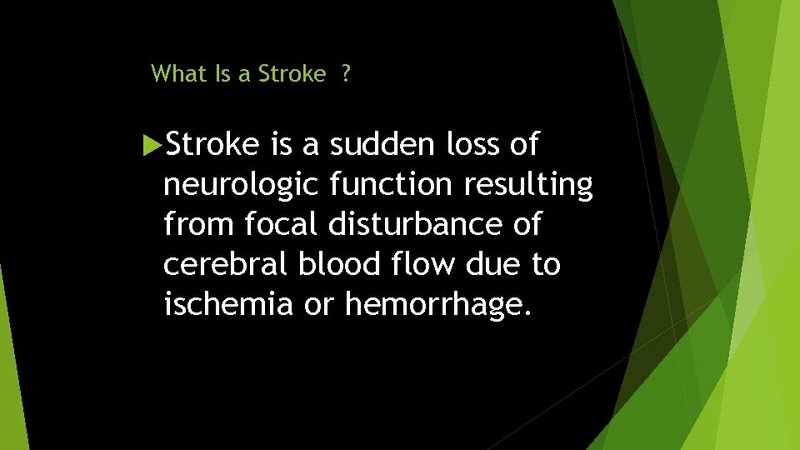 What Is a Stroke ? 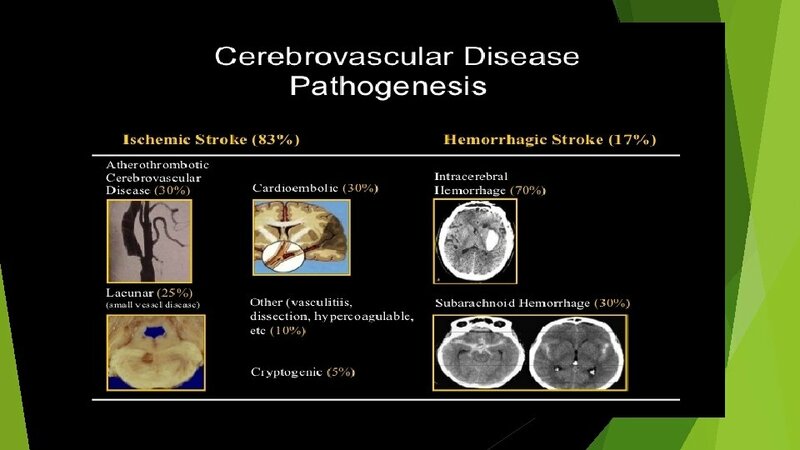 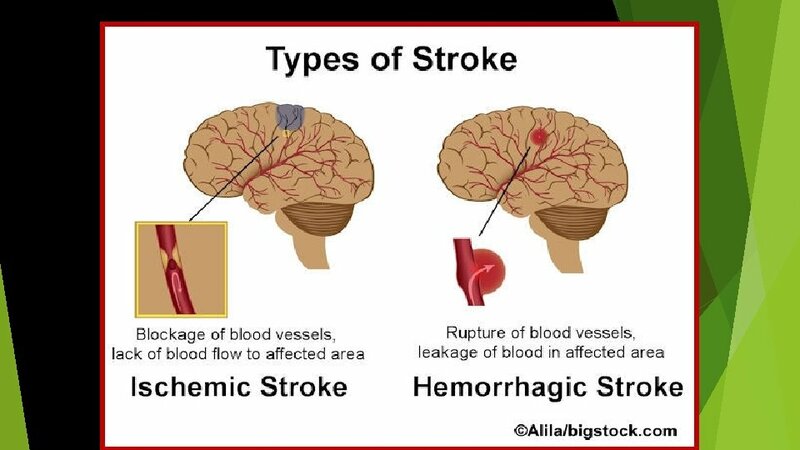 Stroke is a sudden loss of neurologic function resulting from focal disturbance of cerebral blood flow due to ischemia or hemorrhage. 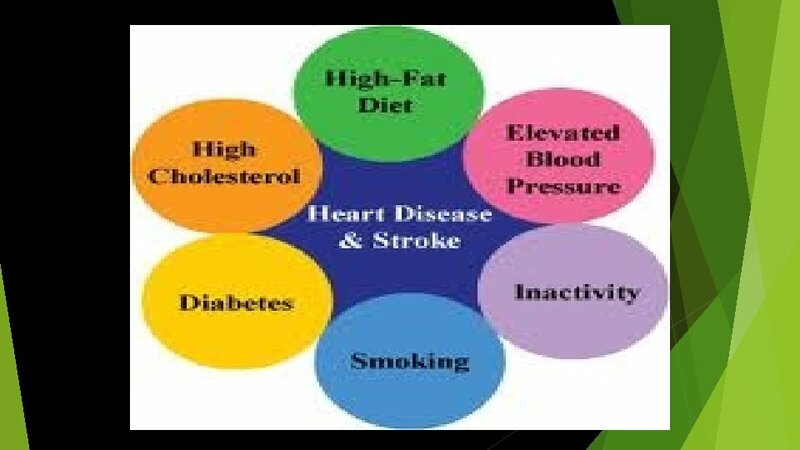 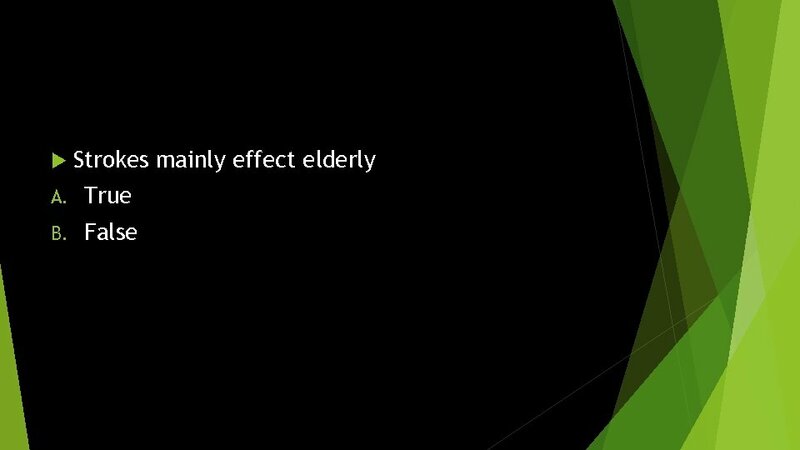 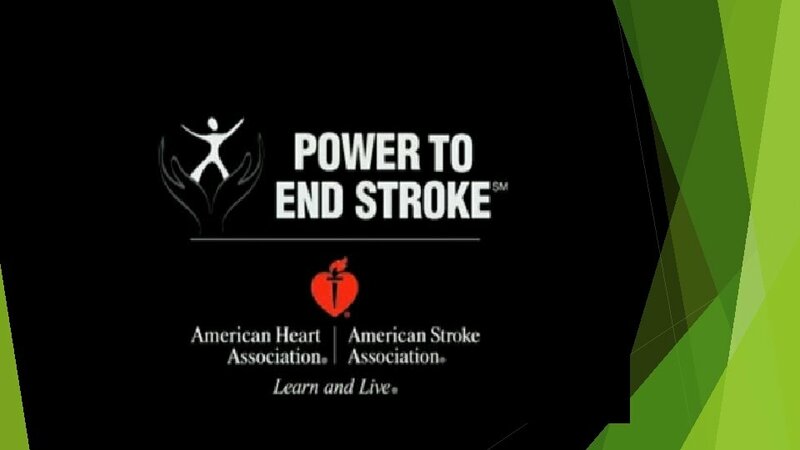 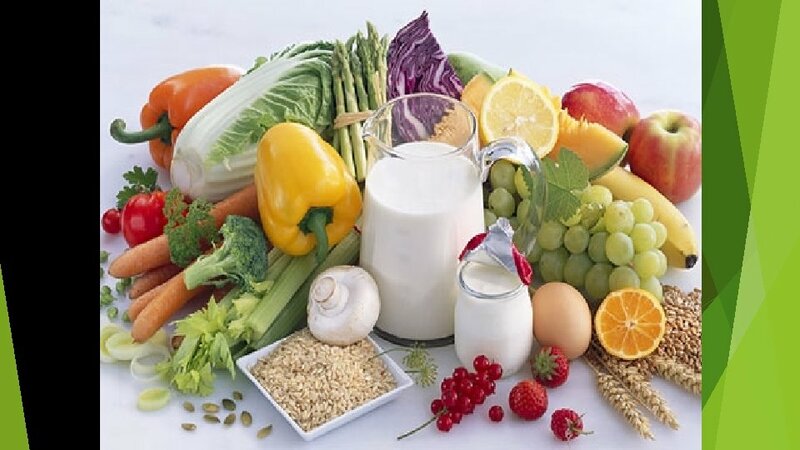 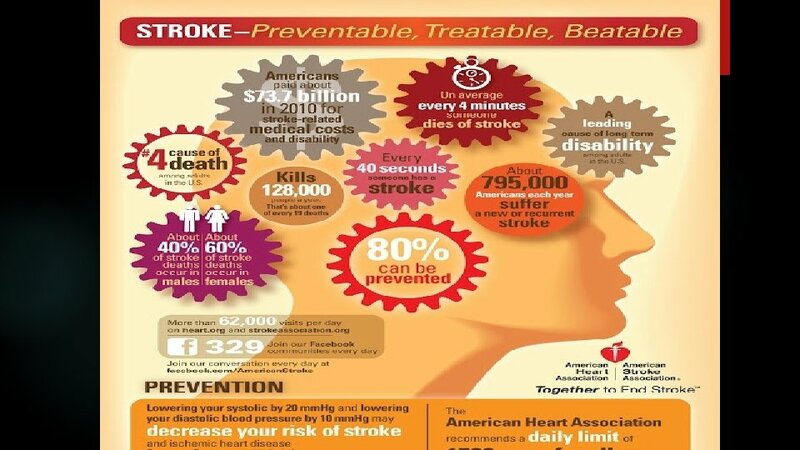 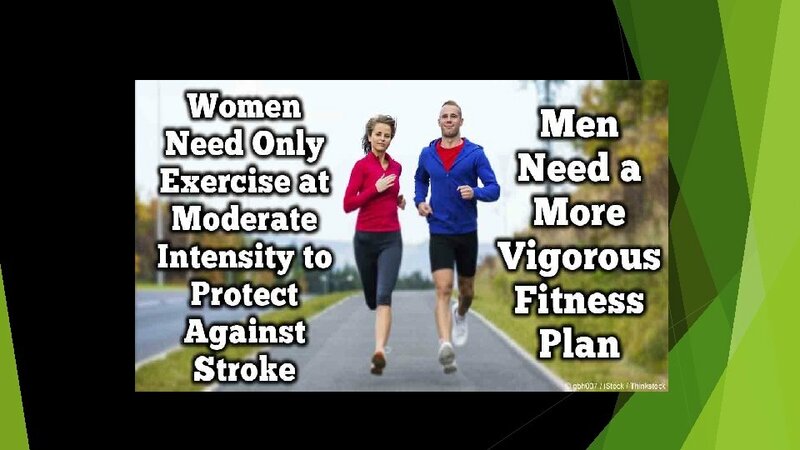 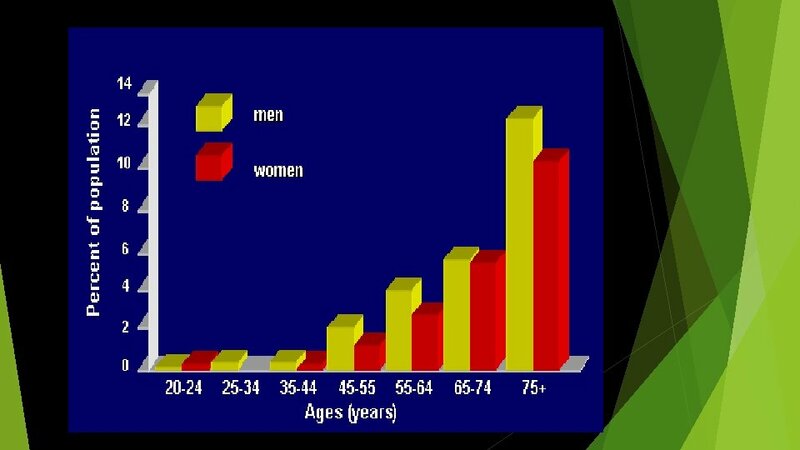 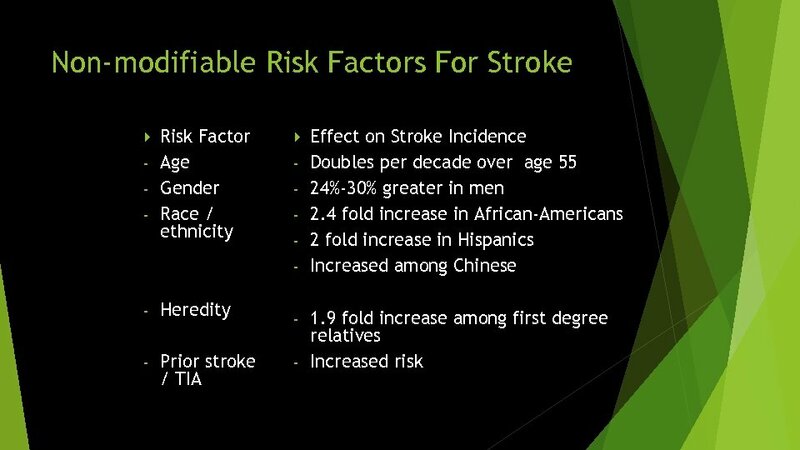 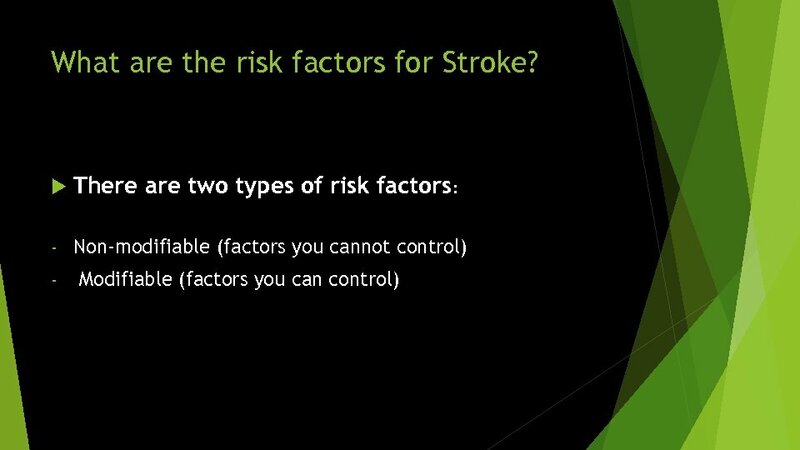 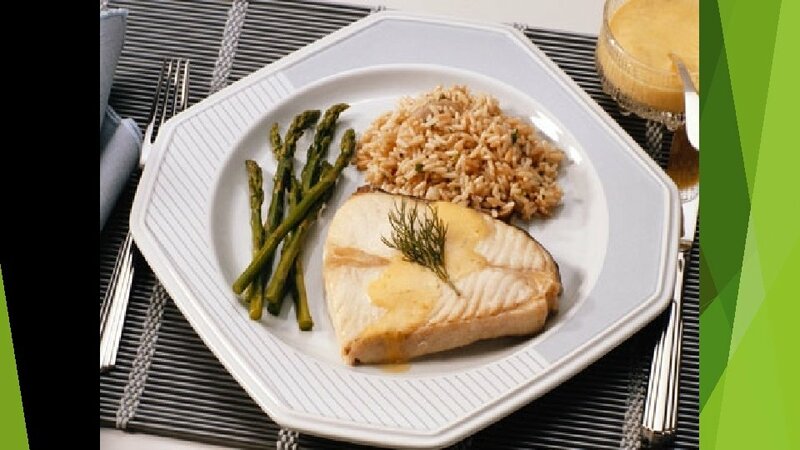 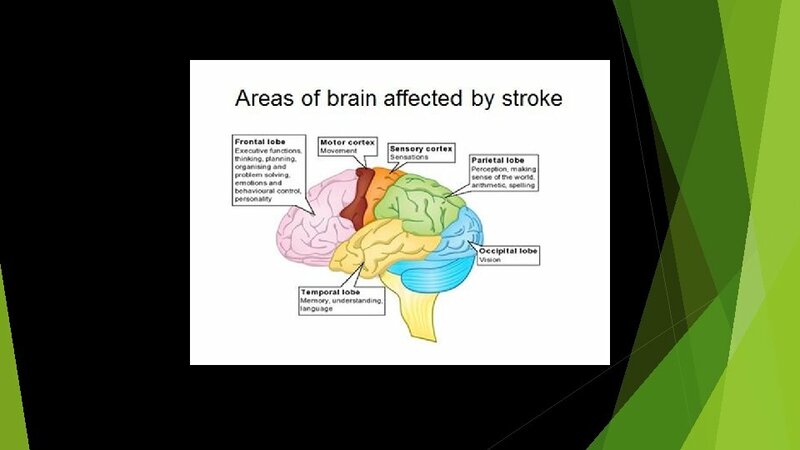 Stroke was the third leading cause of death after heart disease and cancer. 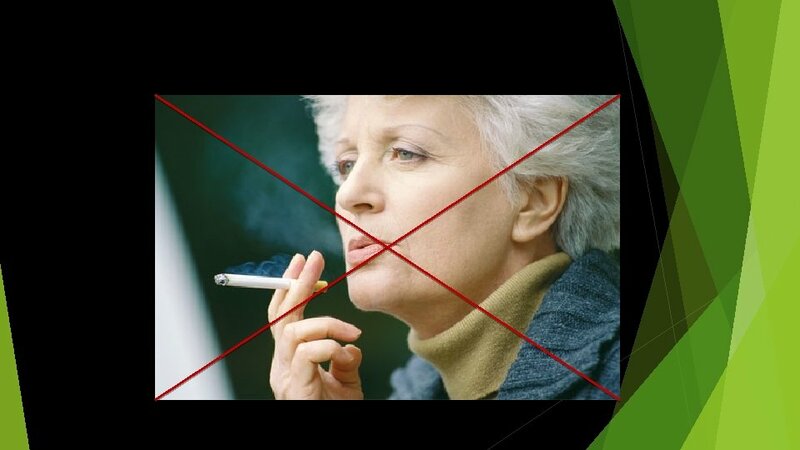 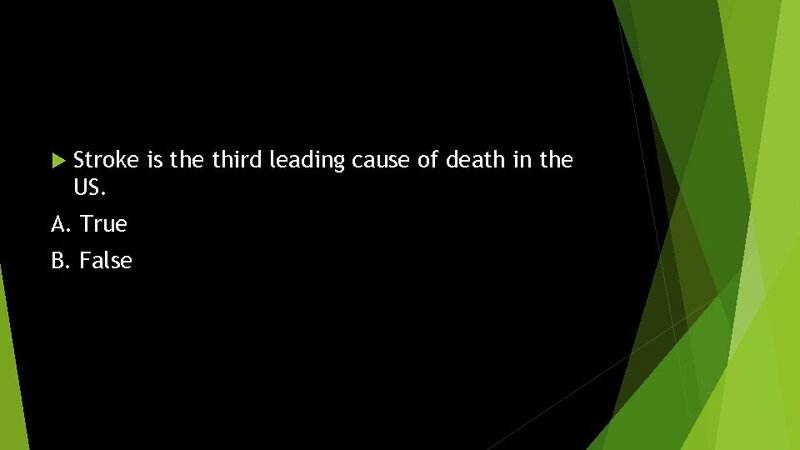 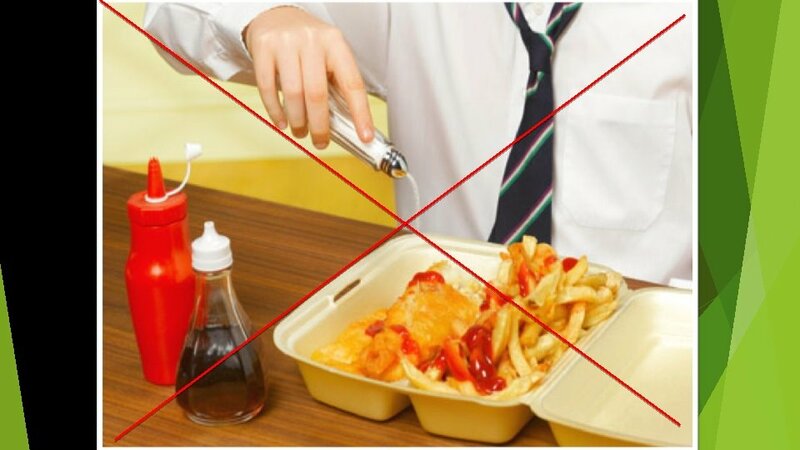 In 2008, it dropped to the fourth leading cause of death. 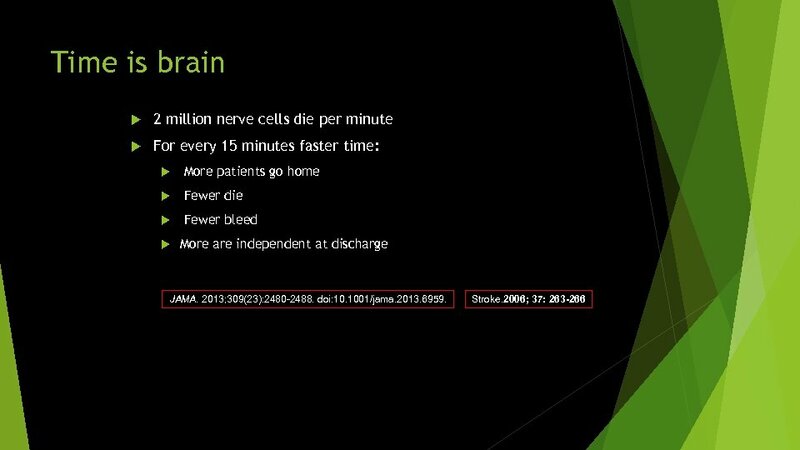 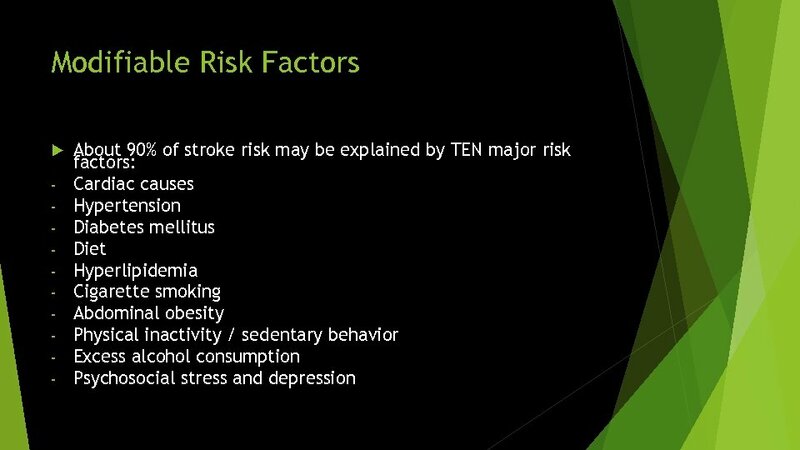 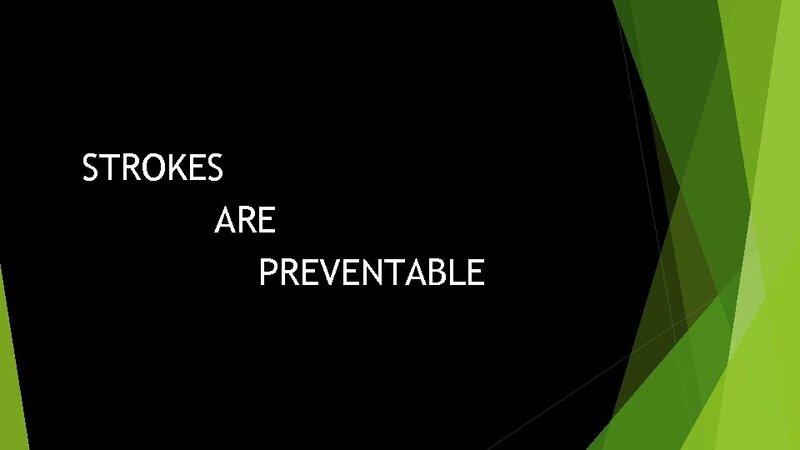 Currently, stroke is the fifth leading cause of death. 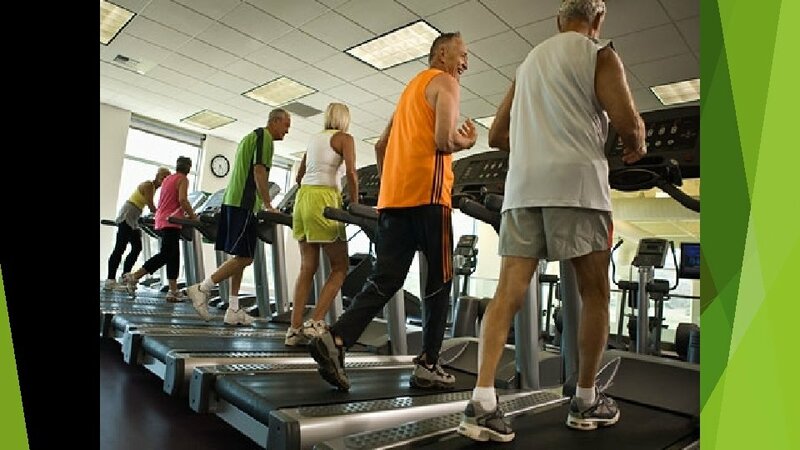 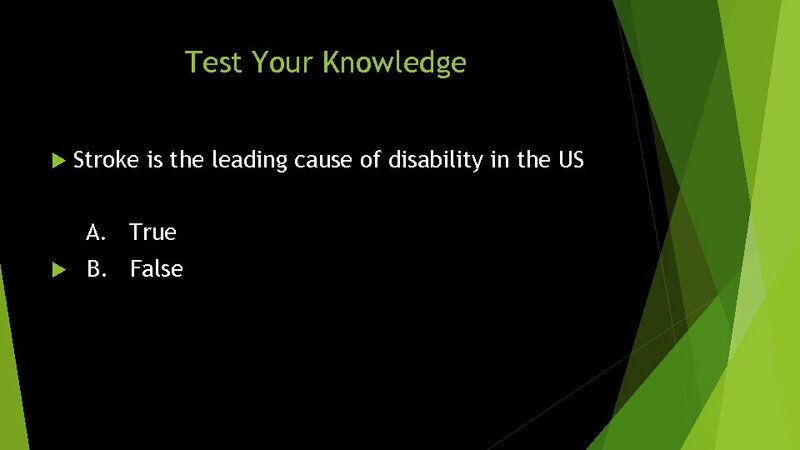 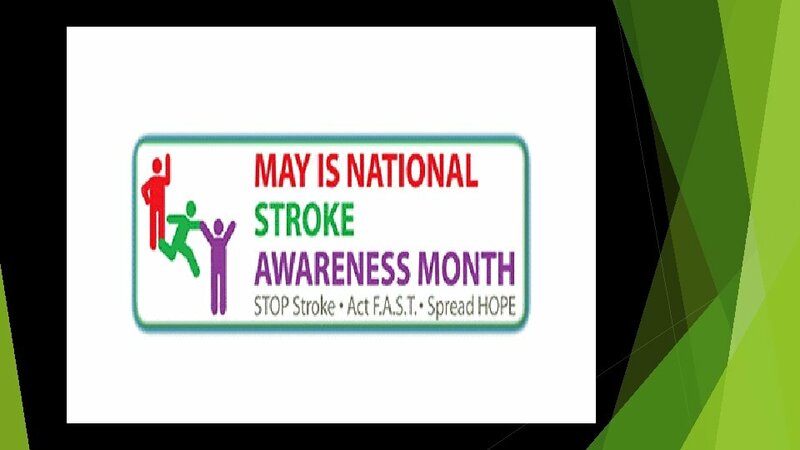 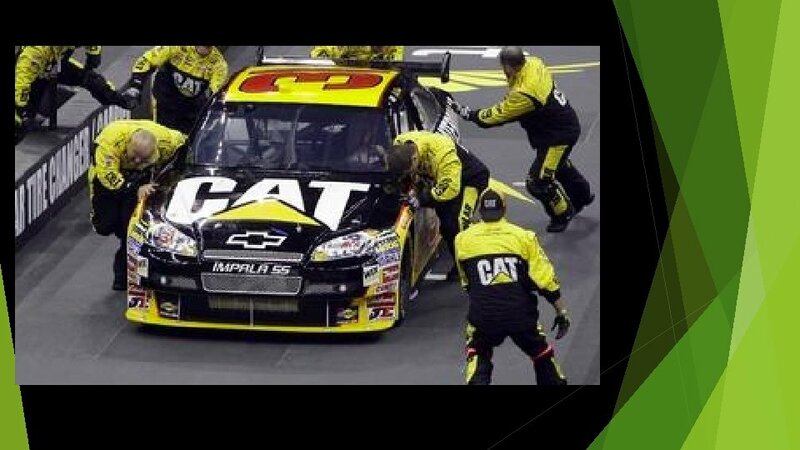 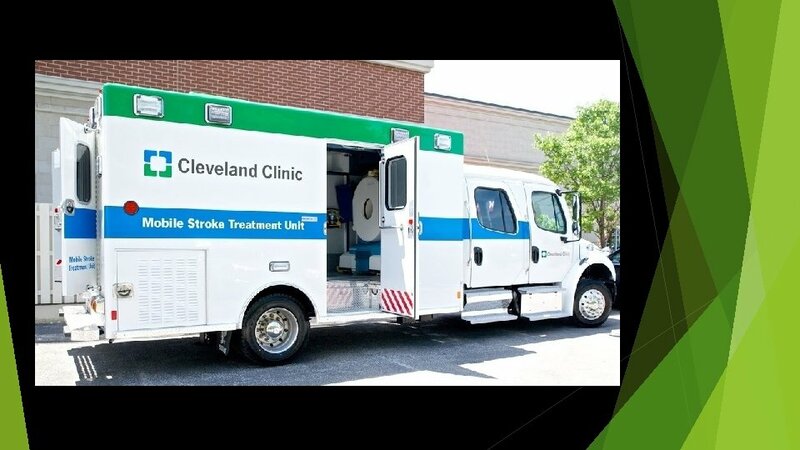 Stroke is a leading cause of disability in the United States. 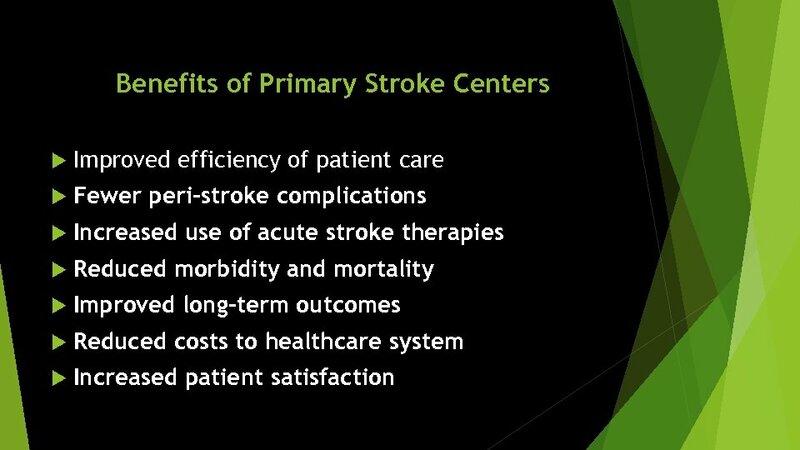 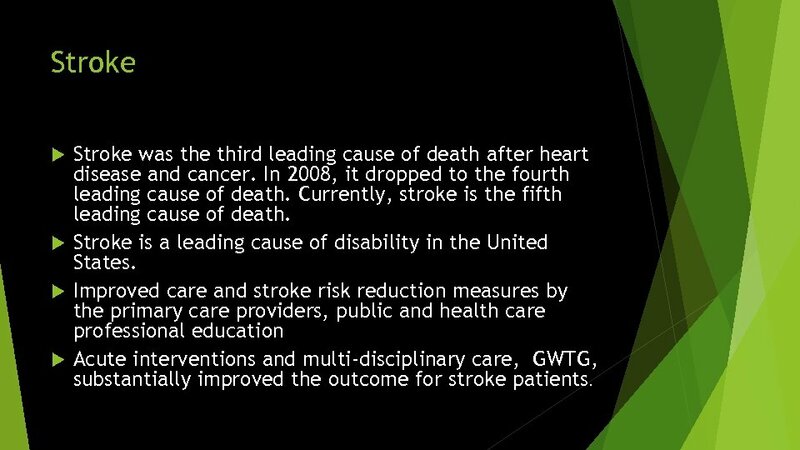 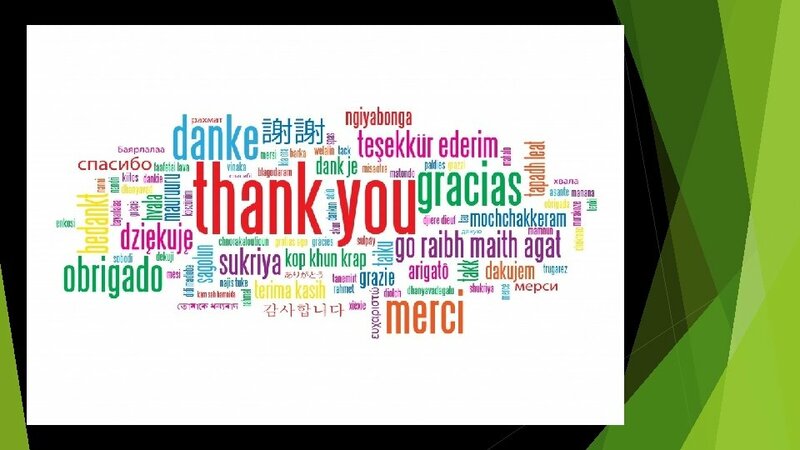 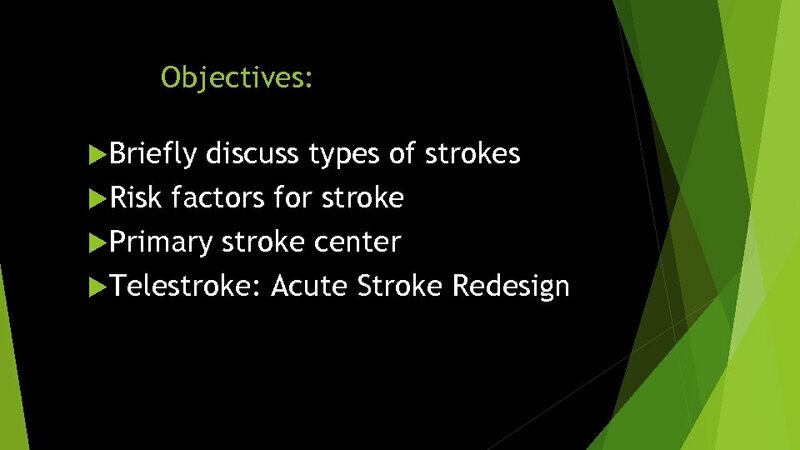 Improved care and stroke risk reduction measures by the primary care providers, public and health care professional education Acute interventions and multi-disciplinary care, GWTG, substantially improved the outcome for stroke patients. 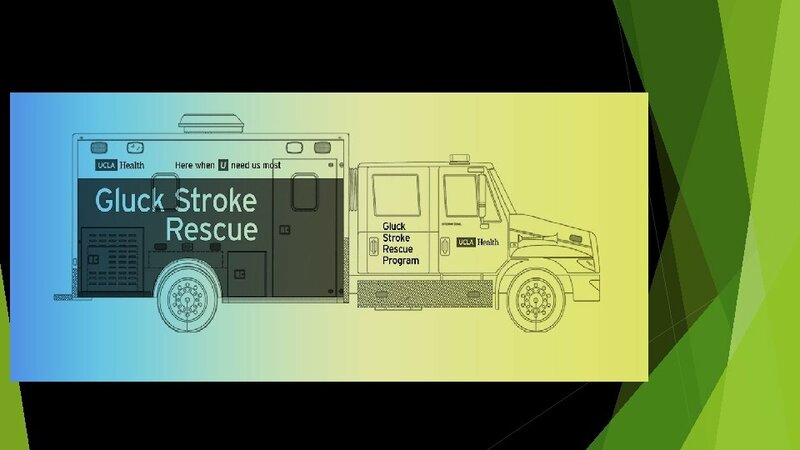 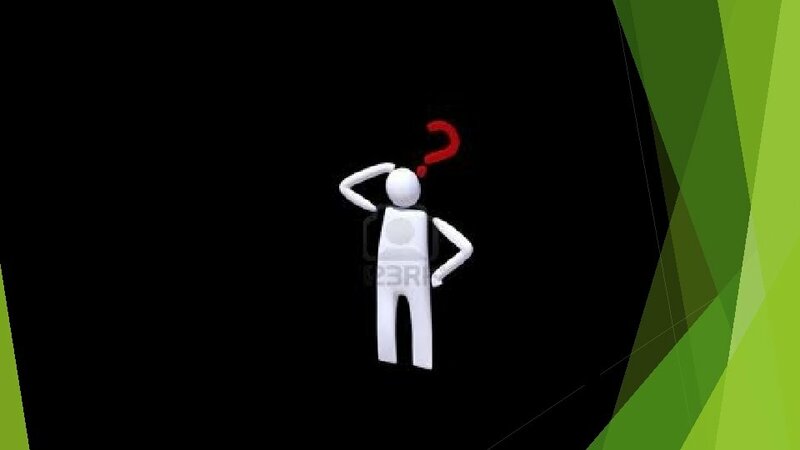 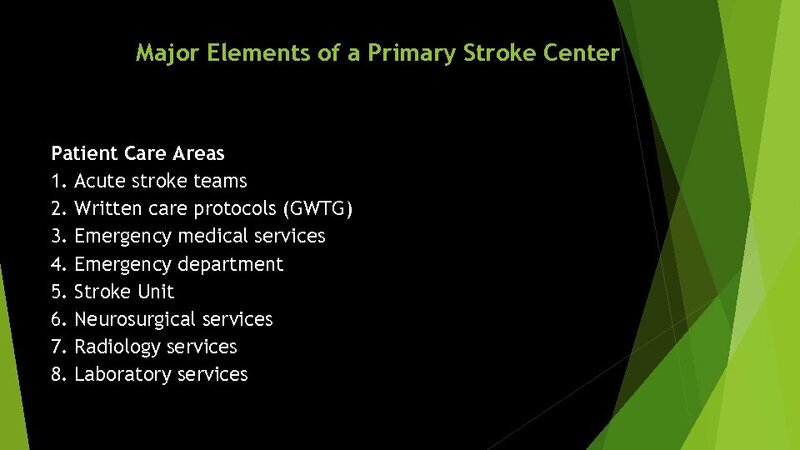 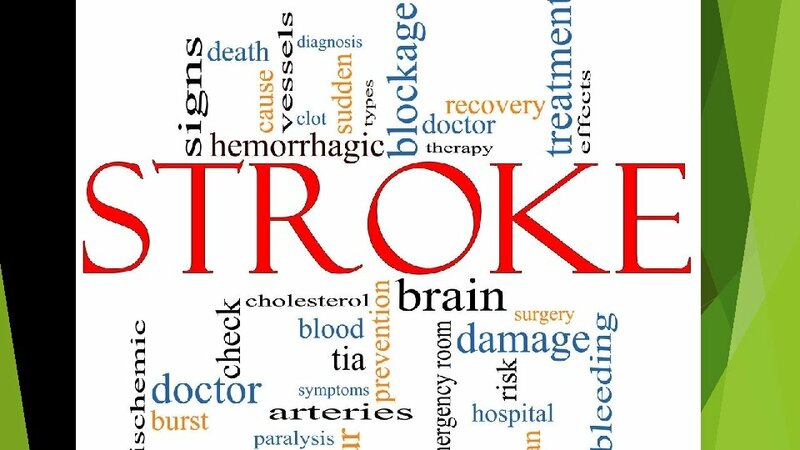 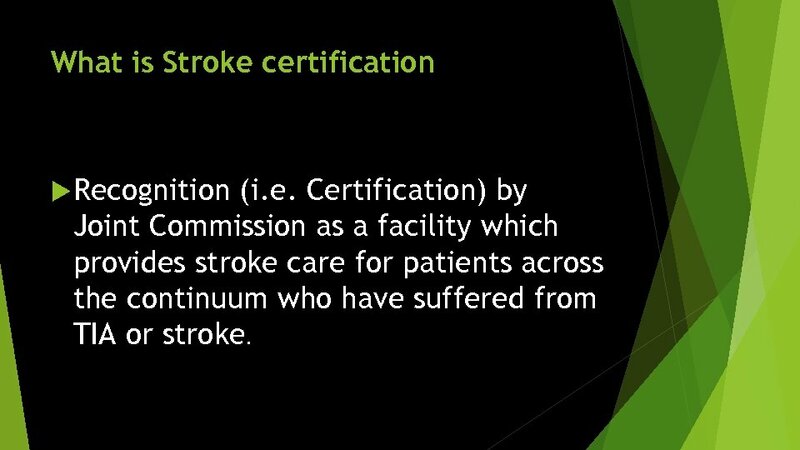 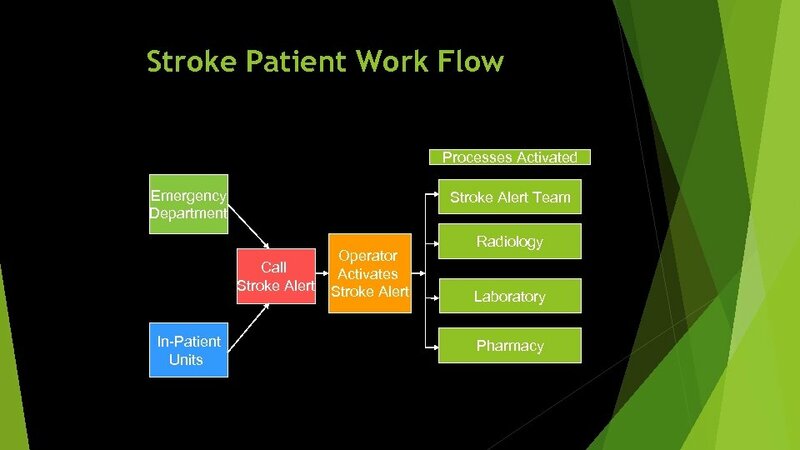 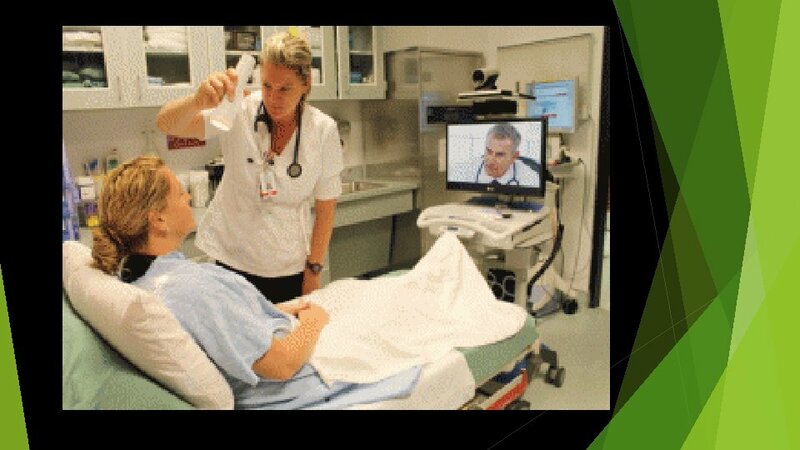 What is Stroke certification Recognition (i. e. Certification) by Joint Commission as a facility which provides stroke care for patients across the continuum who have suffered from TIA or stroke. 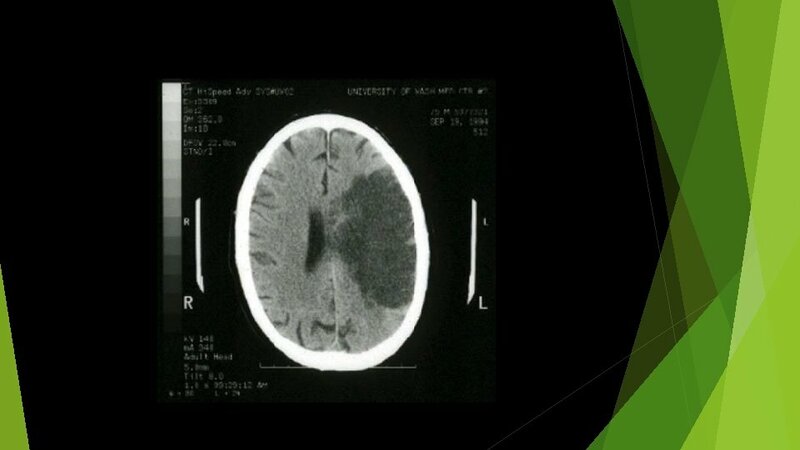 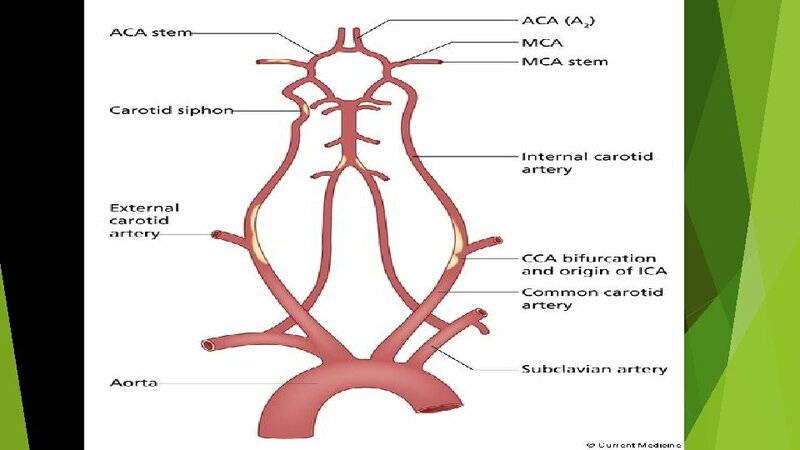 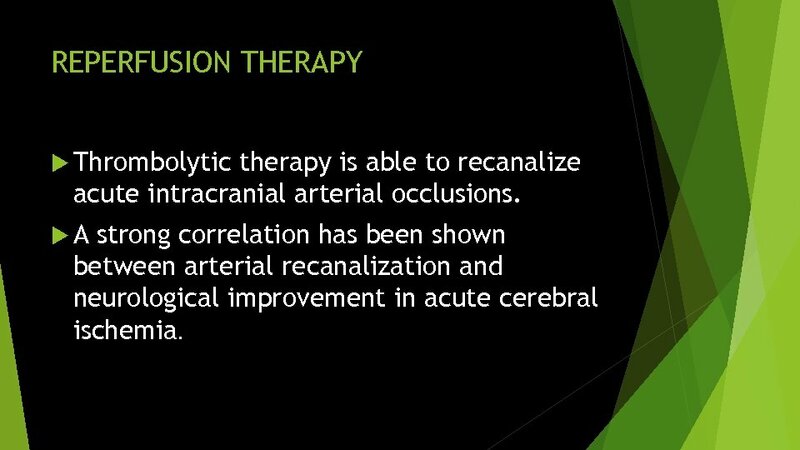 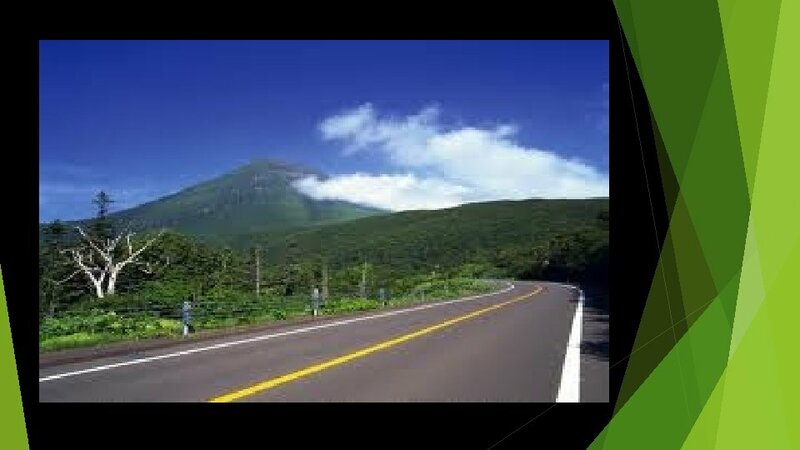 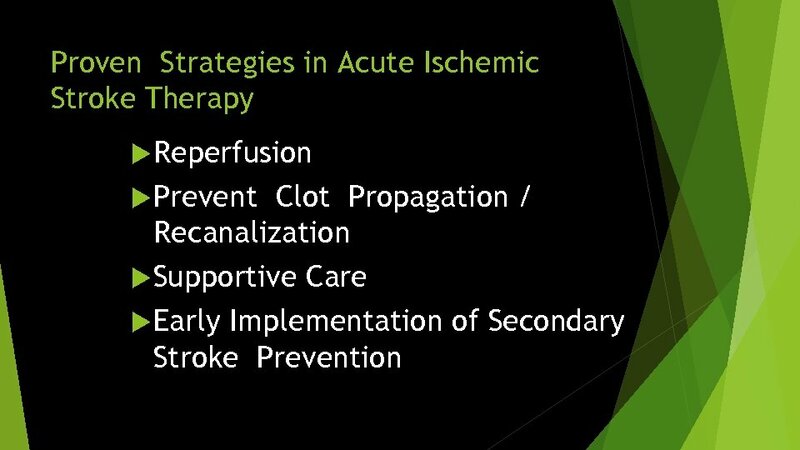 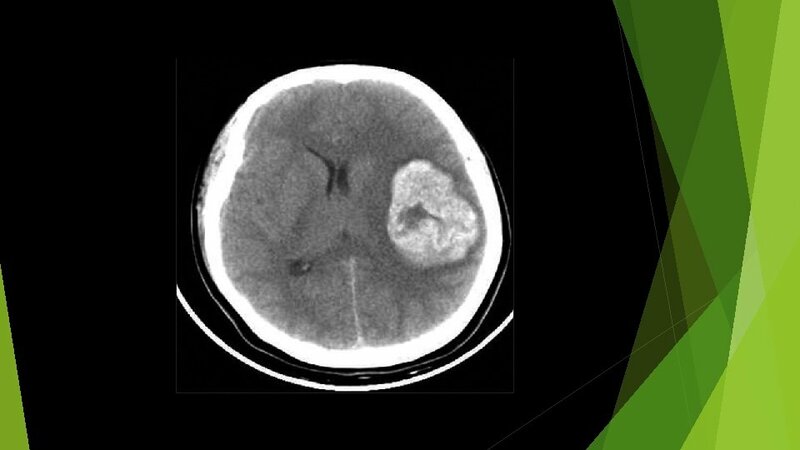 REPERFUSION THERAPY Thrombolytic therapy is able to recanalize acute intracranial arterial occlusions. 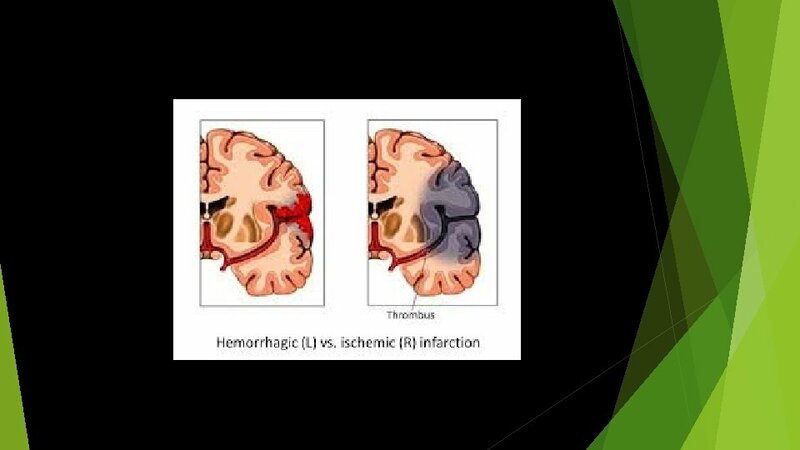 A strong correlation has been shown between arterial recanalization and neurological improvement in acute cerebral ischemia. 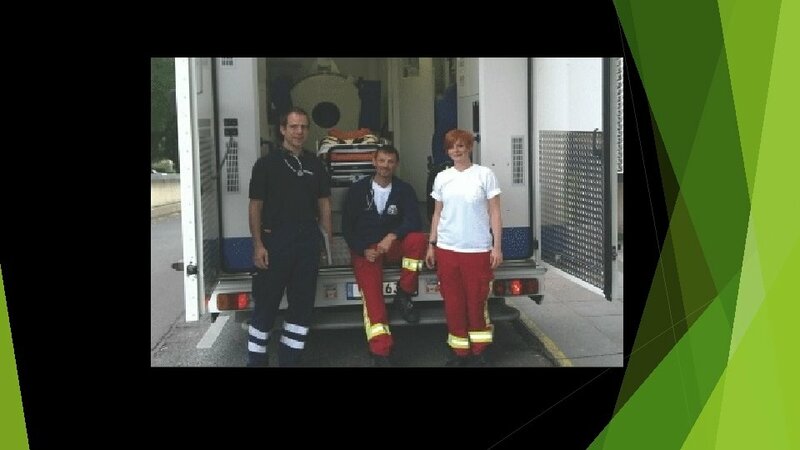 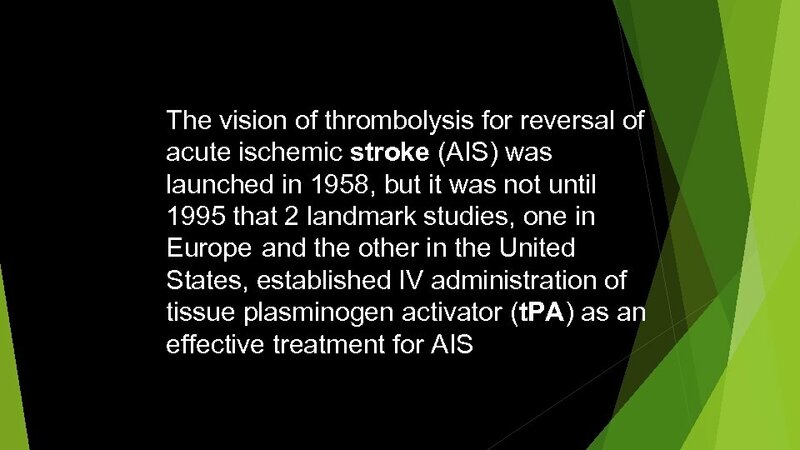 Thrombolytic Therapy In June 1996, the FDA approved the use of IV recombinant tissue type plasminogen activator (rt. 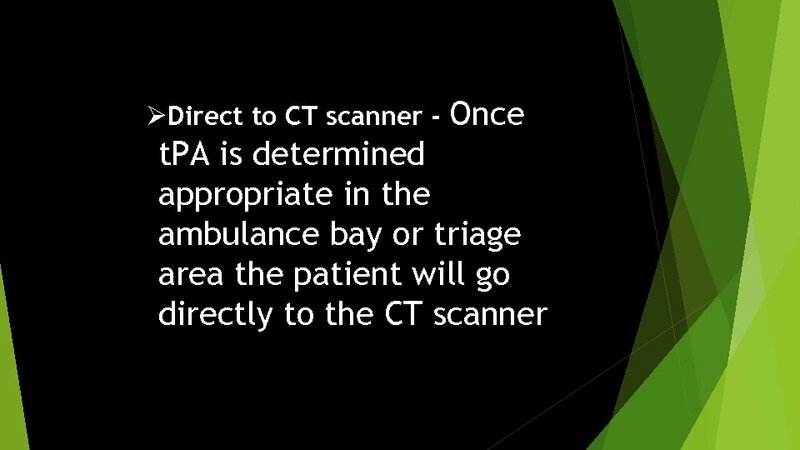 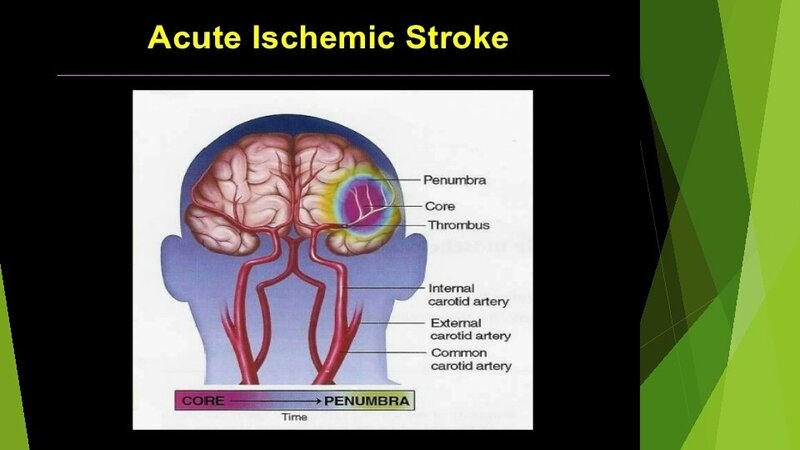 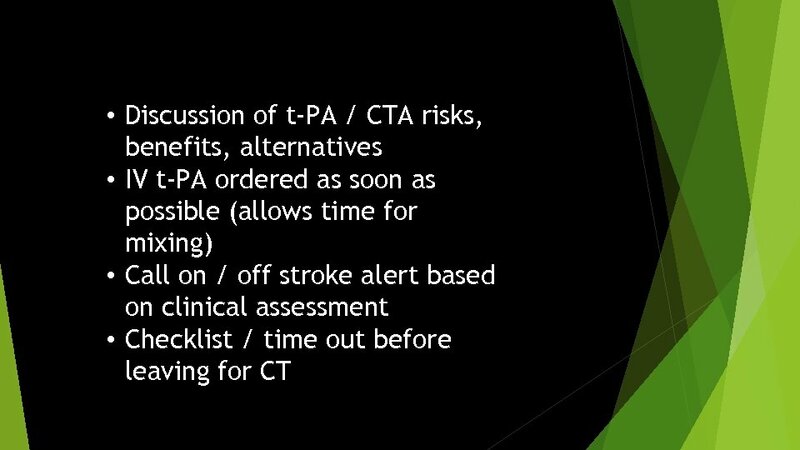 PA) for ischemic stroke within 3 hours of symptom onset. 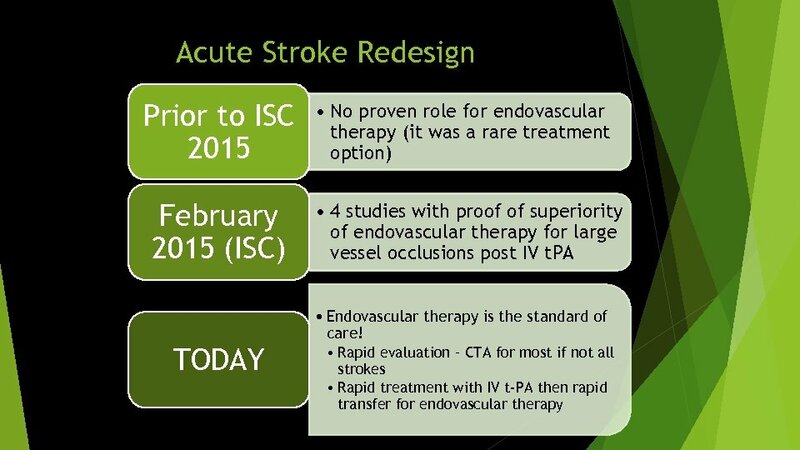 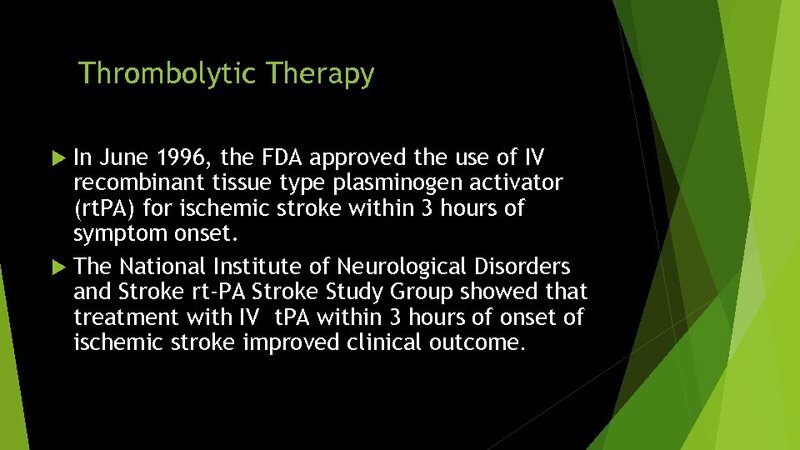 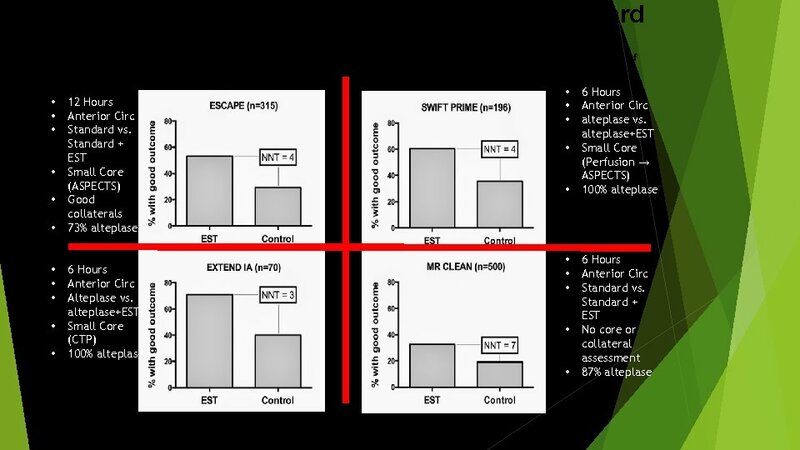 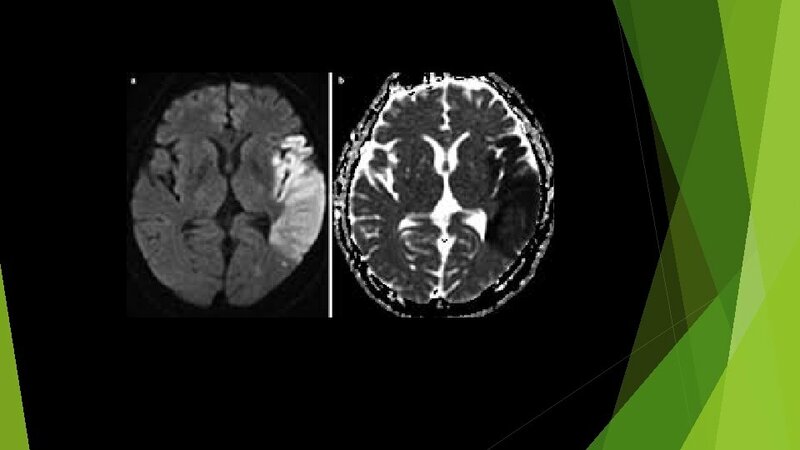 The National Institute of Neurological Disorders and Stroke rt-PA Stroke Study Group showed that treatment with IV t. PA within 3 hours of onset of ischemic stroke improved clinical outcome. 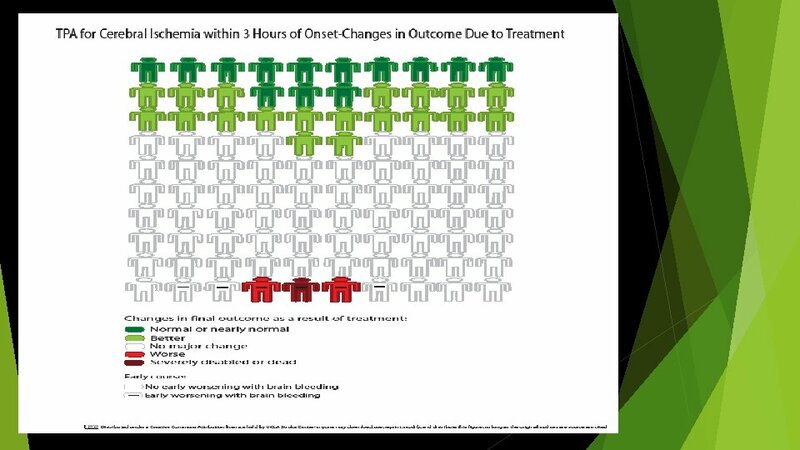 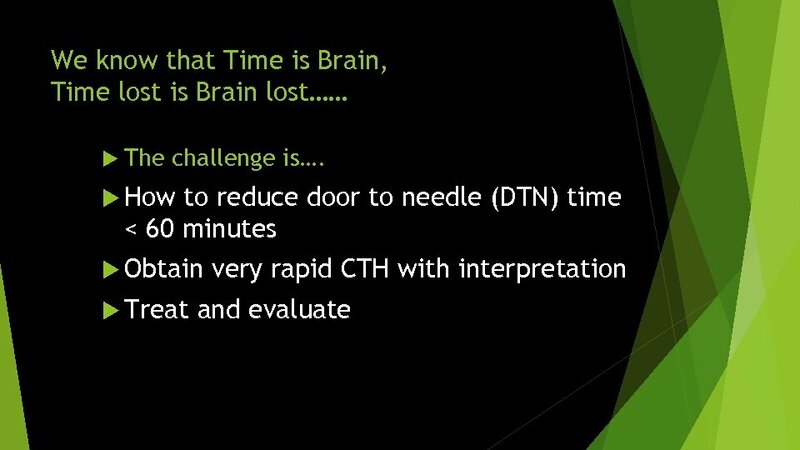 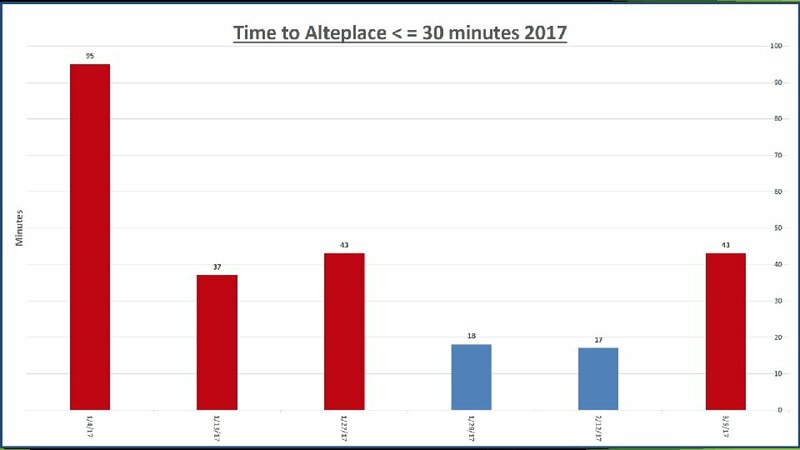 What would it take to… Achieve 20 -30 minutes door to needle (DTN) times? 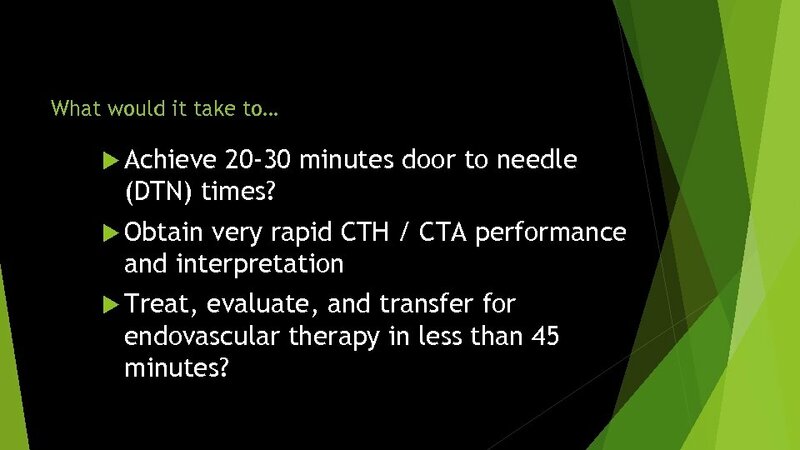 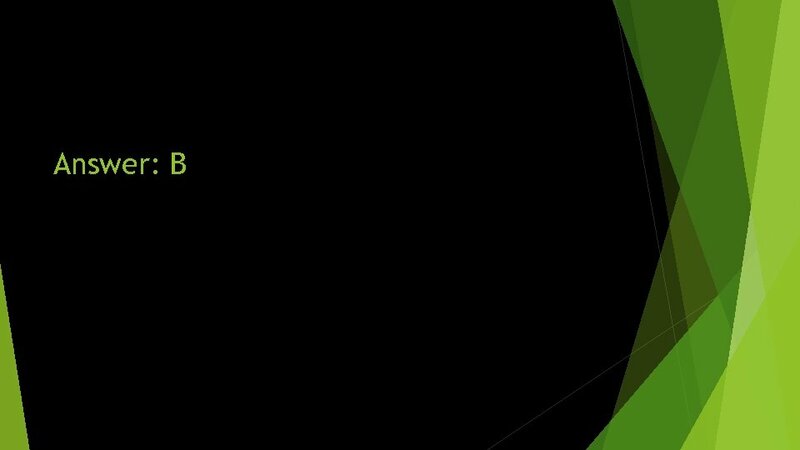 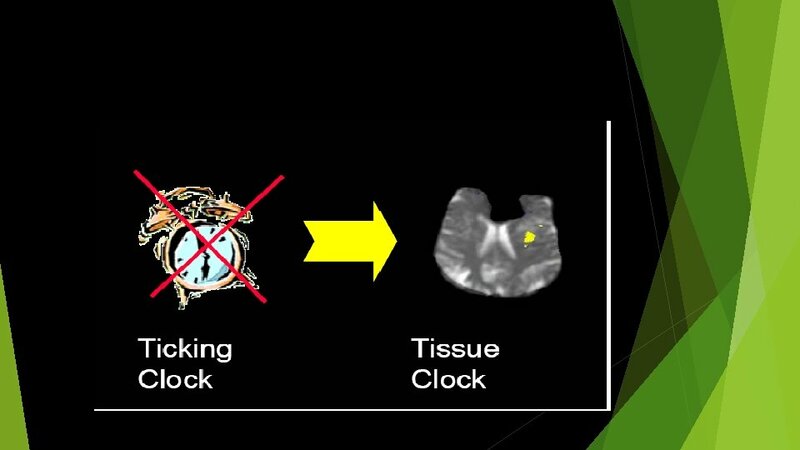 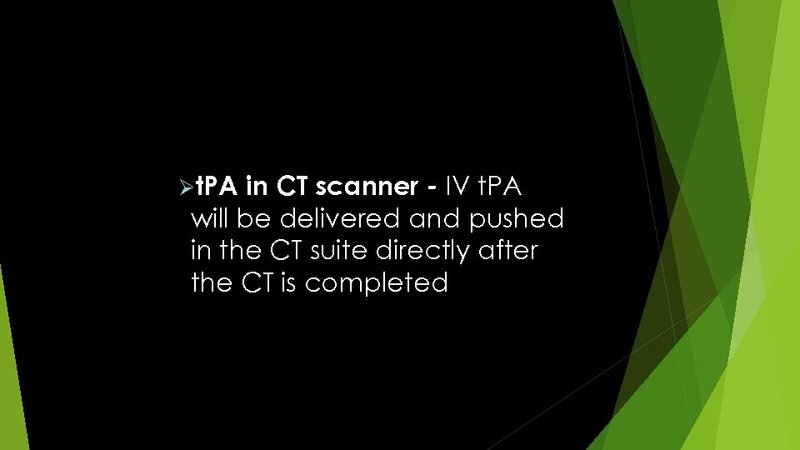 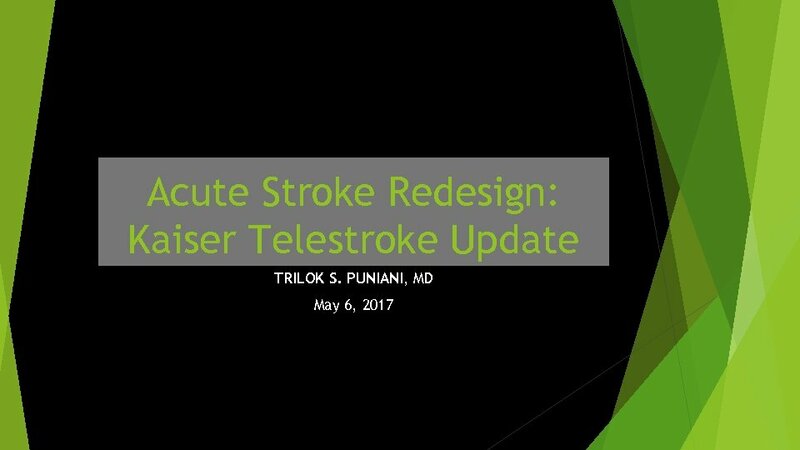 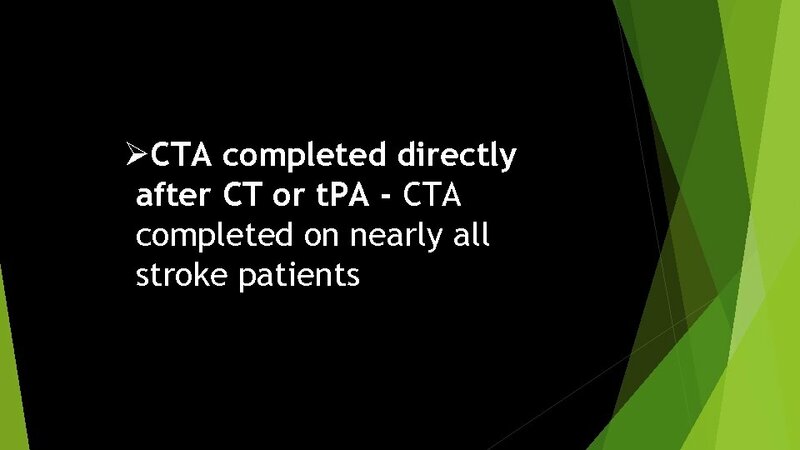 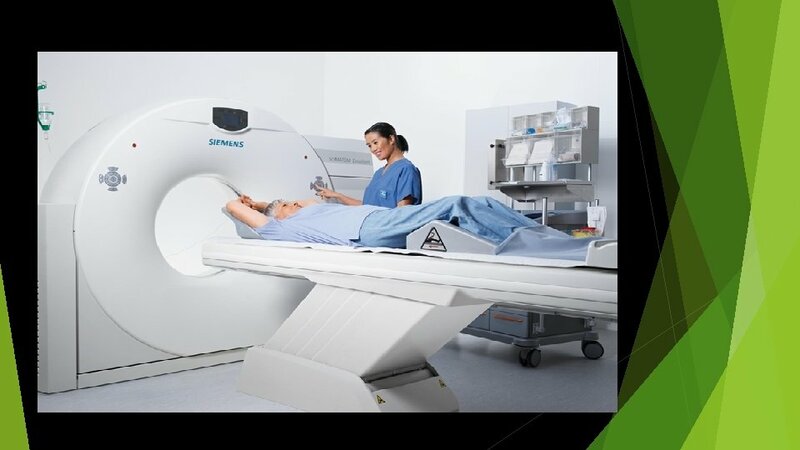 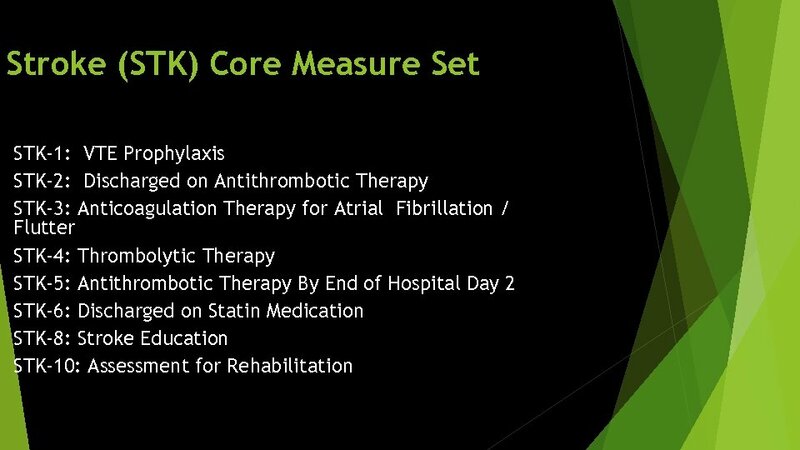 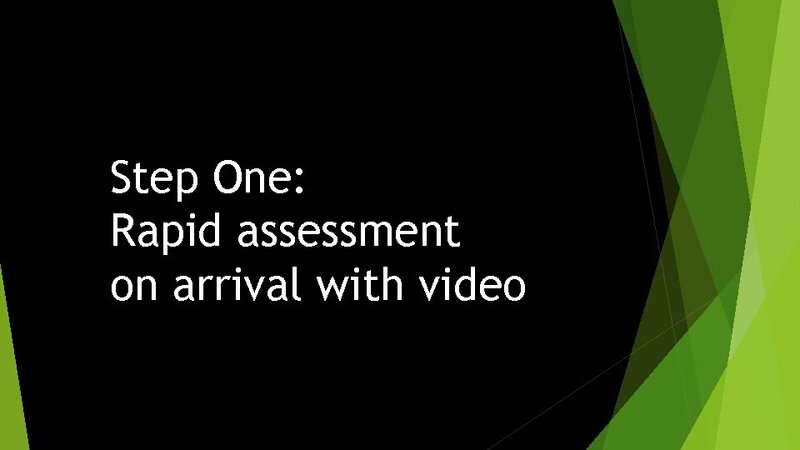 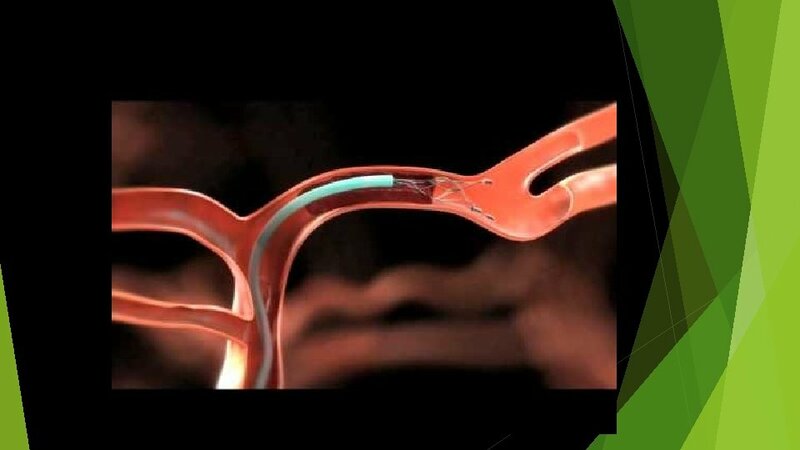 Obtain very rapid CTH / CTA performance and interpretation Treat, evaluate, and transfer for endovascular therapy in less than 45 minutes? 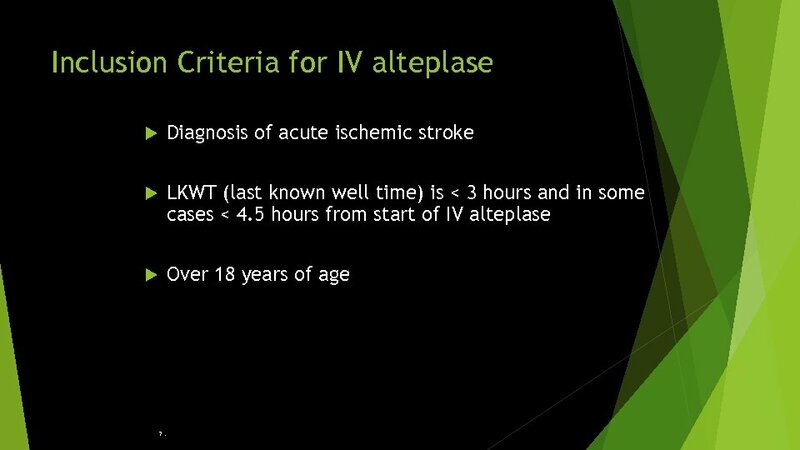 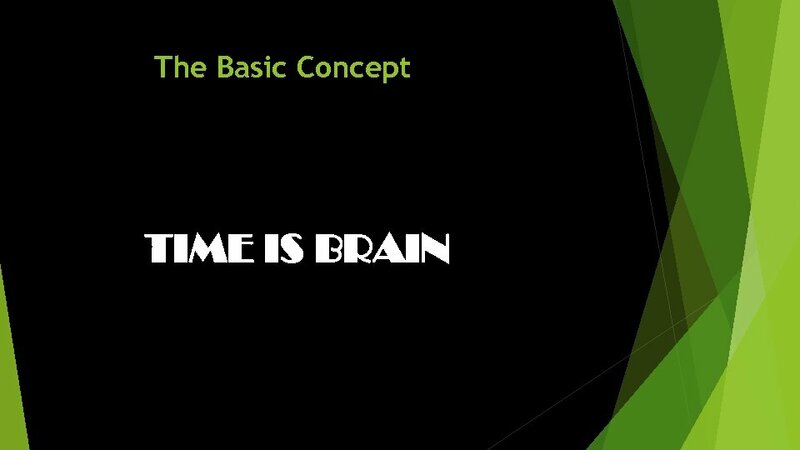 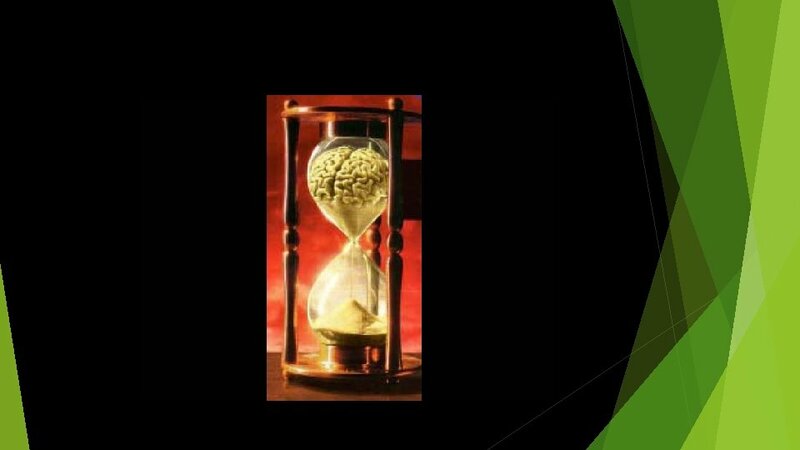 Inclusion Criteria for IV alteplase Diagnosis of acute ischemic stroke LKWT (last known well time) is < 3 hours and in some cases < 4. 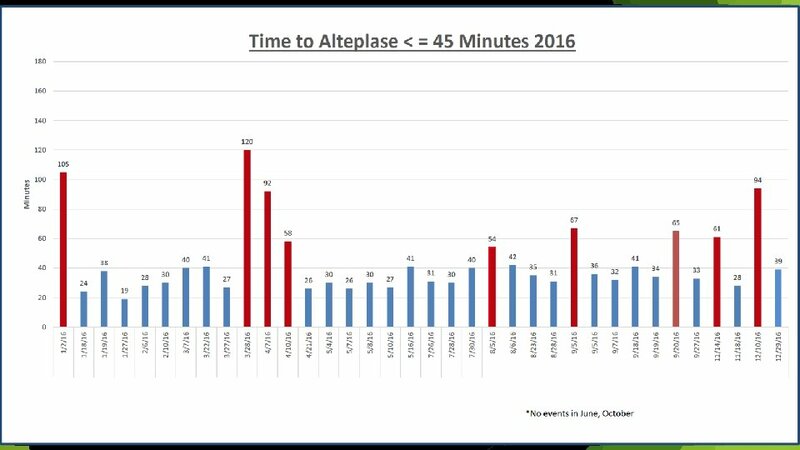 5 hours from start of IV alteplase Over 18 years of age 7. 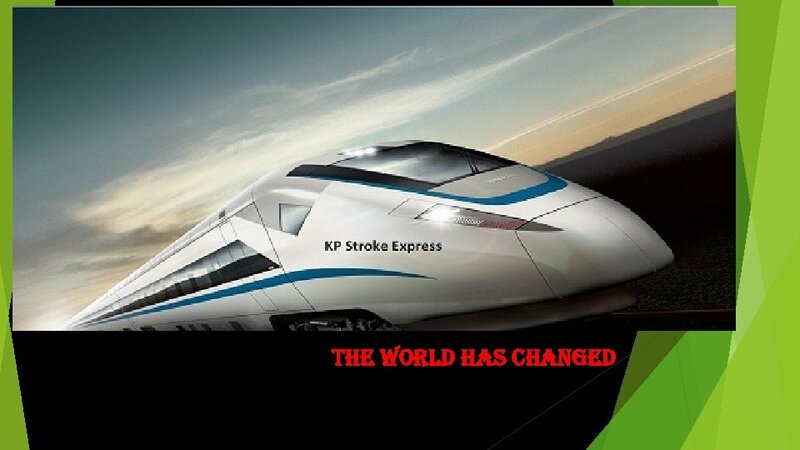 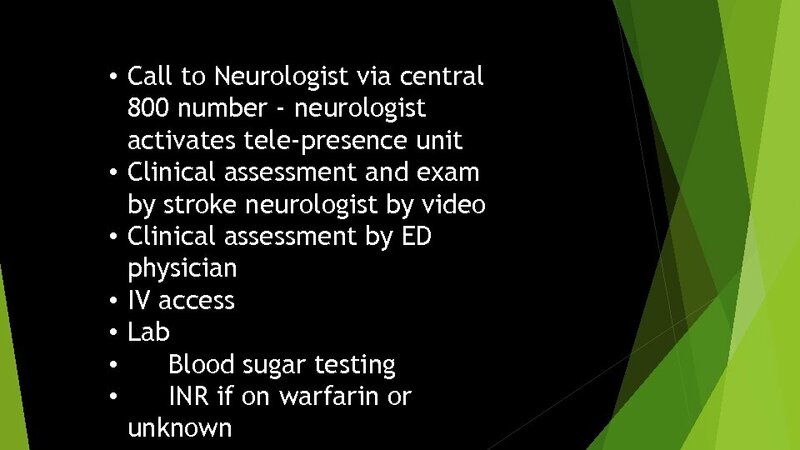 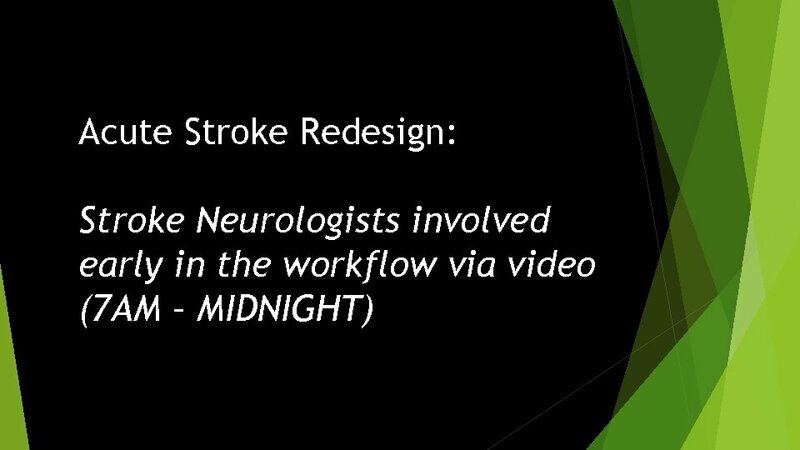 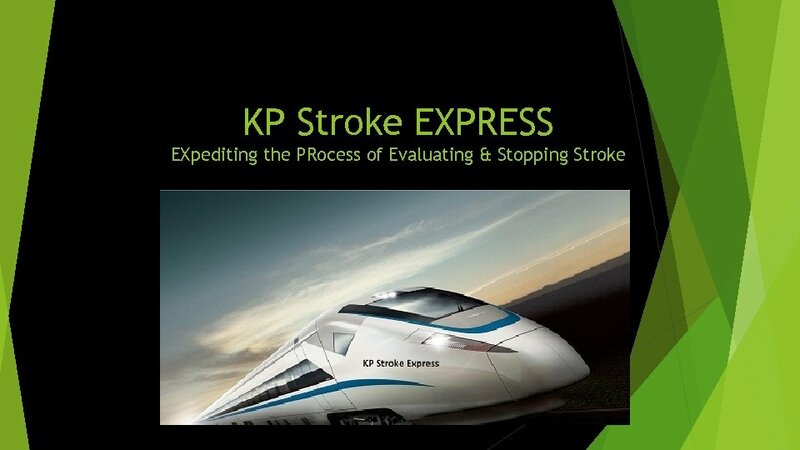 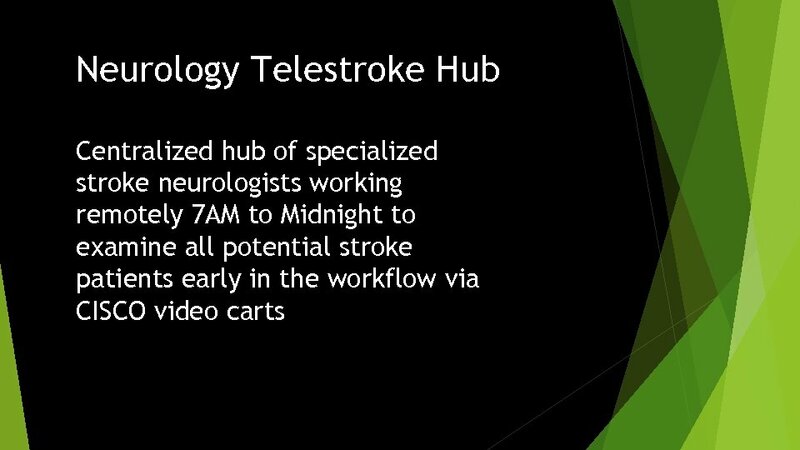 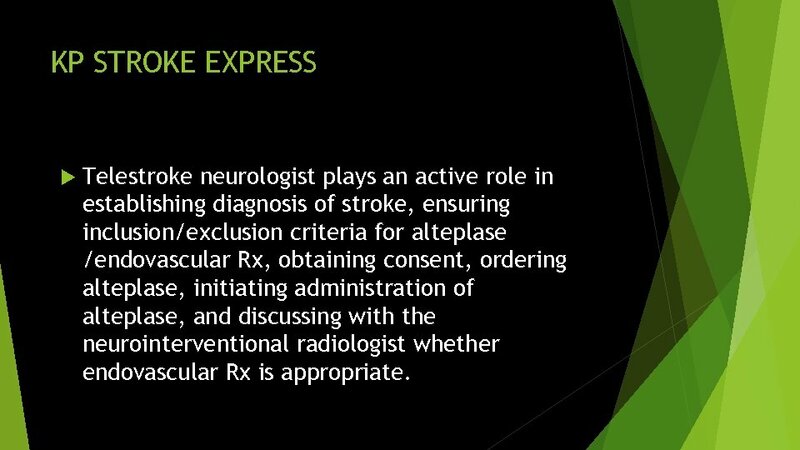 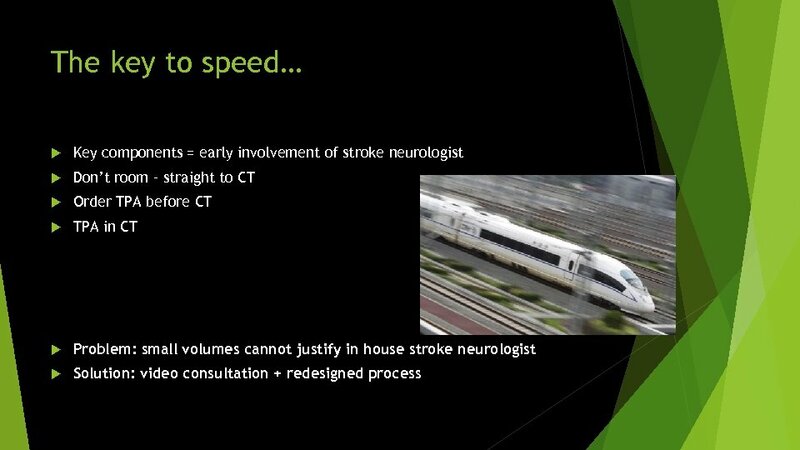 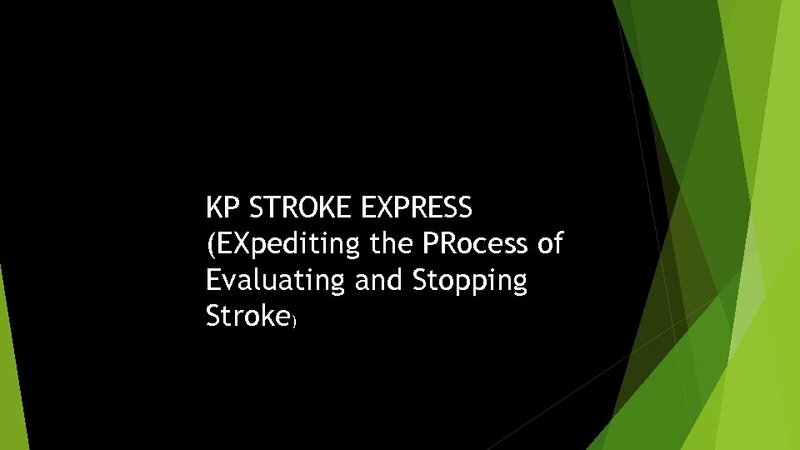 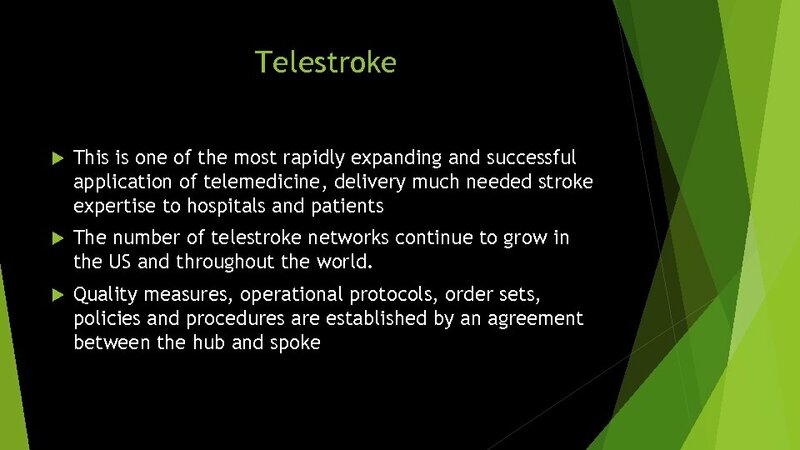 KP STROKE EXPRESS Telestroke neurologist plays an active role in establishing diagnosis of stroke, ensuring inclusion/exclusion criteria for alteplase /endovascular Rx, obtaining consent, ordering alteplase, initiating administration of alteplase, and discussing with the neurointerventional radiologist whether endovascular Rx is appropriate.